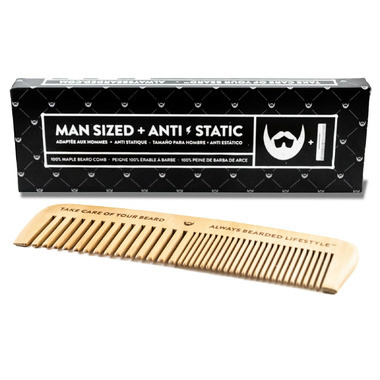 These 100% maple and naturally unfinished manly wooden combs glide through beard hair with a certain level of elegance. 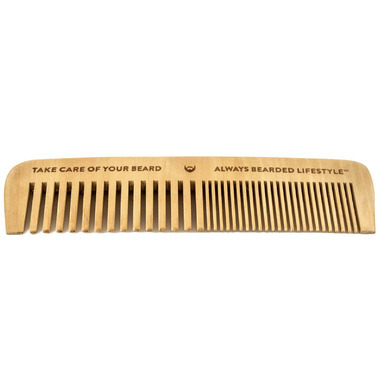 Unlike plastic combs, this wooden beauty will never transfer static to your beard. To top it off, these combs come with a true mark of manhood, a laser branded reminder to "Take Care of Your Beard™" as all true gentlemen should. Constructed from 100% maple wood, every comb's wood grain is unique and brings character to your grooming routine. Comb daily in the morning and before bed to prevent knots and unruly beard hair. Best used in conjunction with other Always Bearded Lifestyle™ beard grooming products. I do not have a beard, but purchased this for my hair. I love it for my wet hair, it removes any tangles easily. It's a pretty good comb, dunno about solely for a beard comb. Unless you have a long beard or moustache (like minimum 1 inch), I'm not sure how useful it will be fore you. It does make a good general hair comb. Beats any plastic comb I've tried, that's for sure. Not a huge fan of the message they have engraved in it, I will likely sand it down to a bare surface. Hubby loves it - he was using a wide tooth plastic comb before - this is much better !!!!! Very nice quality comb, i use it for my hair, my bf use it for his beard, and it's perfect!